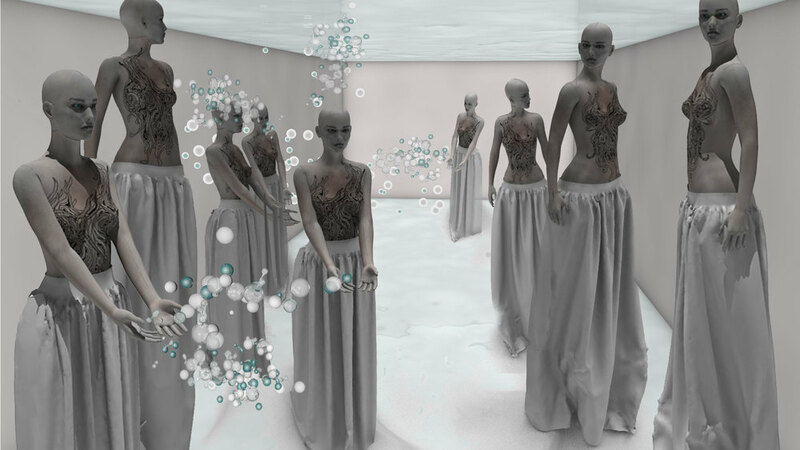 Unwearable Functional: Akinetic Mutism is an experimental animated film depicted a (minority /colored) woman in society through virtual transformed garment and states of Akinetic Mutism. The surrounding, deformed body and symptom of akinetic mutism delivered a specific emotional undergo and struggles. On the contrary, the altered garments, skin, ornaments and objects seek for other solutions. Abulia is a state in which the person loss or deficiency of will power, initiative, or drive. Akinetic mutism is a medical term describing patients tending neither to move (akinesia) nor speak (mutism). The character has a deformed figure and face: She doesn’t have a mouse, some part of body nor movements. The subtle and hidden sexual and racial discrimination constructed the deficiency of will power. Under the circumstance, women are antagonized quietly or sometime silently. It creates another kinds of hidden mustism. This project is inspired by the works of Alexander McQueen and Iris Van Herpen. The intention of empowering women wearing McQueen’s garments and Herpen’s expression of identity combined with desire, moods and cultural setting stimulated the concept of this film. It explores sculpt abstract surfaces, visualizing unseen relationships: between the skin and garments, and its poignant status.